The Jawbone Up is everything I ever wanted in a fitness tracker. Because it's a bracelet, it's always with me. It goes everywhere, it's positively ambient, and ridiculously fun. That's great. Don't buy it. Without a big fix, it's garbage. Some bands have a tendency to fail. They just stop working. The one I tested went deader than Elvis after a week. It's not an uncommon problem. Jawbone is aware of it, but has not yet been able to determine the cause. Despite that, it's still selling them. (The company seems to have discovered what was causing bands to brick. See update below) Read on. Always-on fitness tracking devices have been with us for a few years now. And while many have been designed to be worn on the body at all times (the Fitbit is probably the most prominent) none have worn so well as the $100 Jawbone UP. It has both a hardware and software component to effectively track your activity, meals and sleep. Use it regularly, and you're going to get a wealth of actionable information about your health. It could not be easier to use. You just sync it initially with an iPhone app put the thing on your wrist, and it starts working. The band tracks your movement via an accelerometer. It can tell when you're walking, and more or less how fast. It also tracks your sleep at night. Just push a button at the end of the band to tell it if you are going to bed, working out, or just going about your day. Embedded lights let you know it's in the right mode. To transfer the data it collects, you jack it into the headphone port of your iPhone (more platforms are on the way) and it will send everything it's collected to a sleek little app that breaks down your activity and sleep levels. The app plays a dual role, it also can serve as a tracker itself. It has a diet-tracker that simply has you take a photo of your meal. You can use your phone's GPS to track runs or rides, and see them on a map. It even has a team page, that lets you add friends and create challenges for everyone to participate in. The wearability factor on this is huge. The Yves Behar-designed band looks fantastic, and more to the point works well as an accessory. The big problem with fitness monitors has been nailing a form factor that's truly go-anywhere. If you have to take something off, or swap it out, or even put it down frequently, eventually you're going to forget it, lose it, or just plain ditch it for being too much trouble. The UP, on the other hand, doesn't need to be removed unless you're syncing it with the app, which just takes a few seconds, or charging it, which you won't have to do often (at least I did not). It's comfortable, and water resistant, so you can even wear it in the shower. The rubberized band isn't hot, but when you do sweat, it comes off the band easily and completely, so it should not get skanky with long-term use. You basically forget that it's there other than when people comment on it—and in my experience, the comments were always inquisitive and positive. That's exactly how you want something that's an always-on tracker to work. I also loved the feedback I got from the app. I found myself plugging the band in several times a day, just to see what my step progress was. I actively got up from my desk and walked around when I thought it was too low. In just a few short days, it changed my behavior. And the sleep tracker was really, really cool. It measures wrist movements during your sleep, so it can tell when you're in REM mode, or if you wake up in the night. It turns out I don't sleep that well, even when I sleep a lot. I had hoped to see long term how things like my diet, exercise, and alcohol intake affected my sleep patterns, but that never came to pass. The cap that covers the connecting jack tends to pop off. Lose it, and it costs $10 to replace, plus $5 in shipping if you order from Jawbone's store. You get a three pack for that, but it means that replacement caps effectively cost somewhere between $3-$5 each. Given that mine popped off several times over the course of a week, I'd expect that you'll be buying a few of these. Also, the team feature doesn't have a good way to find other people. The app won't scrape your address book for contacts, nor does it link up with Facebook or Twitter to find friends. It means you basically have to know someone is a user in order to add them. Jawbone says it intends to update that in a future release, which is great. I would have preferred an easier way to sync with the app, rather than plugging it into my phone all the time. But I understand the rationale behind that (battery life) and it's an acceptable trade-off. Still, make the band wireless and it gets much, much better. But aside from the cap-loss problem, I didn't consider the other issues a big deal. They did nothing to diminish the enjoyment and utility I got from the band. The real problem, and it is a major one, is that some bands die. They "brick." For a week, I was in love with this device. It was one of my favorite gadgets of 2011. And then it went dead. It stopped syncing, the lights quit working, there was no way to tell if it was charged or not. No amount of charging, or button pushing, or cursing or praying would revive it. Jawbone is aware of the problem, as this obliquely-worded post points out. Despite all the reports of problems on the forums, Jawbone says the issue is limited and that most customers are not experiencing any issues. "We're not at a point where we think it's super-widespread," CEO Hosain Rahman told Gizmodo. He also noted that it is committed to solving problems for people who do have them. "I don't want any one single person to have a bad experience, so we're ruthlessly focused on taking care of those customers, and if anyone has any issues we'll make sure they are 100 percent taken care of." In short, it will replace your band if it fails. He also admitted that the company still doesn't know why the bands are failing. He says it is in deep forensic mode, and that until recently it didn't have enough bands to perform "rigorous diagnosis." It's now doing that, he says. "We're on it, we're aggressively on it, and we're going to fix it." Yet when I asked why, if it truly did not want one single person to have a bad experience, the company was continuing to manufacture and ship bands before it completed that forensic diagnosis, he did not have what I considered an acceptable answer. "That's a long discussion that we can have some other time," said Rahman, citing slow production, and high demand. Absolutely not. At least, not right now. I even pulled the band from my gift guide. As you'll see all over the Jawbone forums, and as was my experience, these bracelets have an unacceptably high failure rate. And according to people posting there, even some of the replacement bands are failing. The bottom line is that Jawbone is knowingly selling defective products. As much as I want to love this product, because when it worked it was amazing, instead I'm going to give a strong recommendation against buying this for now. Jawbone should stop selling new bands until it is able to fix the issue. I'm perplexed and alarmed that it continues to ship bands knowing many will have defects that will cause its customers to have a bad experience. Short term, halting sales is going to hurt. But it's the right thing to do. Moreover, if it wants the UP to have a long-term future at all, it's the only thing to do. I was excited about this product. If it weren't for the bricking issue, it would be fantastic. I hope Jawbone figures out what's wrong, and fixes it quickly. When it does, I'll revisit this review, and re-rank it. But until that happens I cannot in good faith tell anyone to buy one. 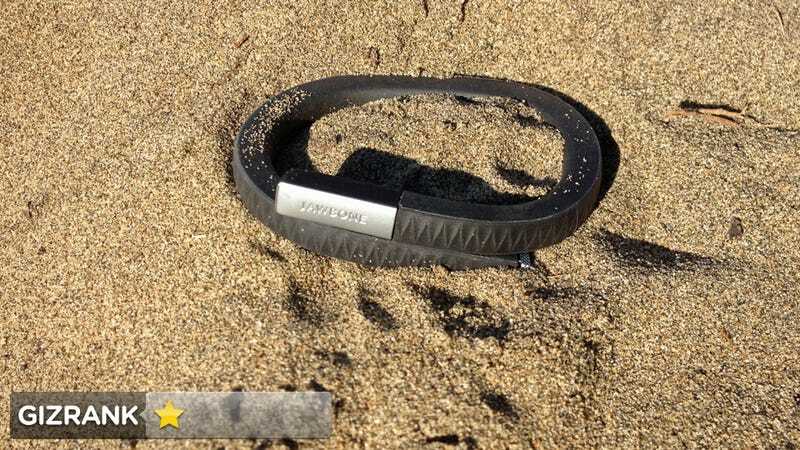 UPDATE: Jawbone believes it has identified the problem with the bands, and is offering full unconditional refunds to everyone who has purchased one. It's also stopped selling new bands until it can make a fix. It's a great move, and as I originally noted above, the right thing to do. I'm sure that was a tough executive decision to make, but it's commendable. As soon as I get a new one in my hands (or more accurately, on my wrist) expect a new review and ranking. Fitmodo runs every Wednesday, covering the world of personal fitness technology. You can play along on our Fitocracy group or the Fitmodo Forum.